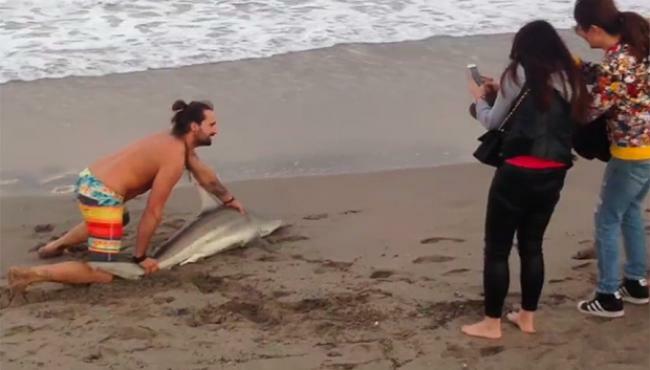 SHOCKING video has emerged of the moment a man pulled a shark out of the sea to pose for selfies with the distressed animal. Shot in Florida, USA, the footage shows the unidentified man return from the water with the shark and posing with it on the beach as it struggles to breathe. It comes days after a Franciscana dolphin was picked out of the ocean and paraded around by a man, so camera-wielding tourists could take a closer look at the helpless animal. At the time, a spokeswoman for Australia’s arm of World Animal Protection condemned the behaviour of the beachgoers who “used the animals [dolphins] for entertainment purposes”. “This terribly unfortunate event is an example of the casual cruelty people can inflict when they use animals for entertainment purposes, without thinking of the animal’s needs,” she told the ABC. In this strikingly similar incident, which was recorded on video, a man can be seen approaching the shark before grabbing it by its tail and dragging it along the sand. The shark attempts to fight off the stranger before it is eventually pulled onto land by the man and held down in the sand. The man then leans over the shark while someone takes a photo. Other people can also be seen taking photos of the animal, which is still being held as it lies limply in the sand. Another man eventually drags the shark into the shallow water but the animal clearly struggles to return to the ocean. Walters said the shark was eventually put farther into the water after the video ended. “It did not resurface for several minutes,” she added on Facebook.